I cook, eat and research on food. A blog to share my hunger on food and how it shapes our everyday life. Welcome to itiriti for food for thought. Yesterday one of the posts from the column – guestspeak popped up on facebook timeline and P enquired if I have decided to abondon the blog. I replied I have been lazy. As I was strolling into the kitchen I spotted two momo steamers. It is no secret that I am a momo and dumpling fanatic and of late I have lost my craving for momos thanks to mayonaisation. Over the past few years momos have emerged as a street food across Delhi and there is a make shift momo stall near many a metro stations and bus stops across the capital. Nutri nuggets has infiltrated the chicken momos, we even have tandoori momos and we have started dipping momos in mayonnaise. If you think is it going to be another nostalgic trip? Yes, you are right. As I wrapped and stacked away one of the momo steamers I remembered that ten to eleven years ago I was so enamoured by momos that I gifted one of my dearest friends a momo steamer for her wedding, without removing the price sticker. To my defense, I had never bought wedding gifts and since I thought we loved momos so the most logical thing was to gift her a steamer for her new kitchen. Many years later when I recounted this incident to one of my friends he said that it speaks of a special bond. True. A decade has passed by and today as my old fridge stopped working I received a whatsapp image of the beautiful kitchen garden she has been working on for months. She told me of the saplings that she is nurturing in egg shells to gift me. I told her that I will keep aside a planter to plant the saplings as soon as he gifts me. Over the years, I have come across people who are passionate about food and take a keen interest in my work on food. Two of the most exciting gifts I have received are two art works. One is titled Dey’s special Dilli Dekho Trips and the other a Delhi food map which has a very pointed instruction – Map to point, not to scale  I would be ashamed to list down the books which I have acquired through coercion, coaxing and reciprocity. Next comes cutlery sets and kitchen utensils which friends have gifted me over the years. Finally, spice box sets and tea collections. I might be missing out few things related to food and kitchen that have not made its way into the list. Over the years I have started gifting friends interesting, quirky items and however my penchant for utilitarian items has not fizzled. Latest entry into that long list of gifts exchange is a pressure cooker bought for a friend to celebrate her 30th birthday. Gifts come with a pressure of parting and it would be worthwhile reflecting on gifts we have found it difficult to part with. I will keep aside such confessions and turn your attention to my mother and her sister’s gift exchanges of tiffin box and a dear friend’s possession of gifts bought for her friends. My mother and her sister shared a common fondness and anxiety of possessing tiffin boxes. My mom and aunt had an eye for tiffin box of all makes and sizes to keep left over foods. They fondly gifted each other tiffin boxes and as years went by their collection increased. During one such gift exchanges my mother gifted her a tiffin box to realise that she had exactly gifted her the same tiffin box three years ago. On other hand, my aunt gifted a tiffin box to my mother. She started using it and it so happened that she ended up returning one of the same tiffin box thinking that my aunt had sent homemade goodies. I have never seen my mother buy a tiffin box ever since my aunt passed away. She has decreased her visit to the utensil market but her incessant complaints about lack of tiffin boxes has not ceased but to this date she regrets for mistaking a gift. On the other hand, a friend of mine has a particular tendency of not being able to part with gifts she buys for others. She bought a beautiful book, wrote a sweet note for me and kept it in her bookshelf. When she realized that she was not able to part with it she decided to gift me another one. She thought its best to buy and gift a thing immediately before she develops any attachment. As I had some engagement she hung around in my neighbourhood for hours and landed up in my place mid-night so that it won’t find its way into her kitchen. Hence it’s best to say that there are several emotions attached to gifts and gifting. Each culture has its own rules associated with gifts. As we step into the festive season and work on our checklists to buy gifts it would be worthwhile to step aside and think of moments of joy, reluctance and anger we have experienced in gift-exchange. 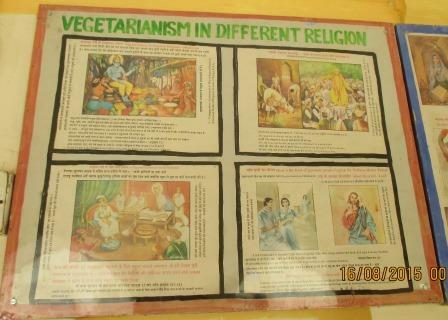 As we made our way through the Jain Group of Temples in Khajuraho we stumbled upon this gem – a permanent exhibit on vegetarianism. Could not make sense of this ! World famous veg personalities !! Things to do and not to do – How to be a good child? 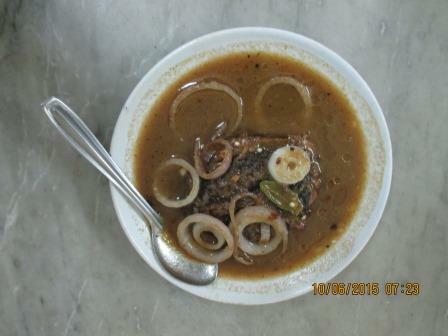 The second food trail I would suggest if you are in Kolkata during summers is to hop around Boipara. Boipara is a neighbourhood of books. And Calcutta boasts one such boipara which bears the imprint of the colonial pasts, reform movement as well as the student movement that rocked the 70s. It is the epicentre of some of the finest schools, colleges and needless to say books. M.G. Road named after Mahatma Gandhi connects College Street to Howrah Station and Sealdah station, the two stations that hosts thousands of trains. As you walk by the lanes of College Street / Boipara, you will be welcomed into the world of books by numerous hawkers rattling off latest testpapers for Madhyamik/ Uchhamadhyamik, guidebooks that will help you sail through JEE/ PMT/IIT as well as I.C.S.E., I.S.C test papers. Stalls are painted with white, blue and yellow to announce the latest arrivals and the treasure house of most of these stalls lie in the stack of piled old books. Amidst these book stalls, there are some famous places to eat, chat and debate, perfect adda places. One of the legendary institutions in College Street is the Coffee House. As one makes way through the stairs, posters of various student organisations lead you to the first floor and no trip to Coffee House is complete without a cup of Infusion. It will take you an entire day to taste what is available on the menu and my favourite picks are Chicken Kobiraji and Chicken Cutlet. In my last visit to Coffee House, I braved the rains and waited for a friend who was visiting the city. Both of us made our way to Coffee House and polished off the Chicken Cutlet and Infusion and after an adda which ranged from Malaysia’s politics to my careers I told A that we are going to Paramount. Paramount needs no introduction to my friends and colleagues from Kolkata. 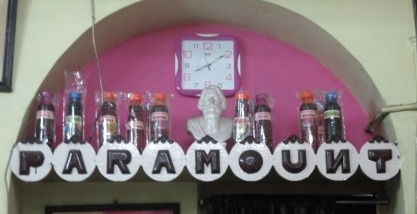 This legendary institution by late Nihar Ranjan Majumdar has been selling home-made drinks since 1918. A and I sit occupy one of the benches and we ask for a menu. The menu arrives and we are spoilt for a choice to have close to special drinks made from pulp of passion fruit, mango, tender coconut, strawberry, pineapple and others. For cream lovers there is cream rose, cream lemon, cream lemon and even cream lassi. 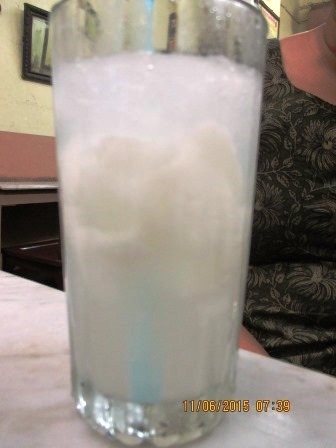 Both of us settled for Dab Sarbat( a drink made from tender coconut). Dab Sarbat reminded me of a custom of buying school text books in summer holidays in College street followed by a stop over at Paramount. I convince A to order Dab Sarbat. As we sip our drinks, an elderly gentleman walks up to us and ask us if we liked the drink. A tells him its her first visit and she really likes it and asks about the recipe. The gentleman sits down with us and shares a fascinating journey of Paramount. The gentleman is none other than Mrigendu Majumdar. 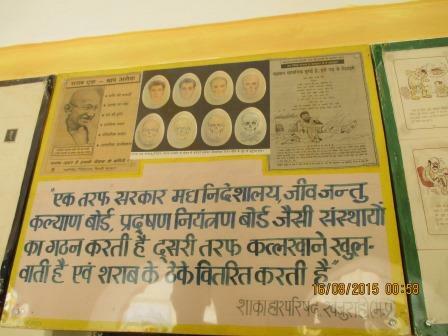 He tells us that Tender Coconut Sarbat was created under the guidance of famous scientist Acharya Prafulla Chandra Ray. 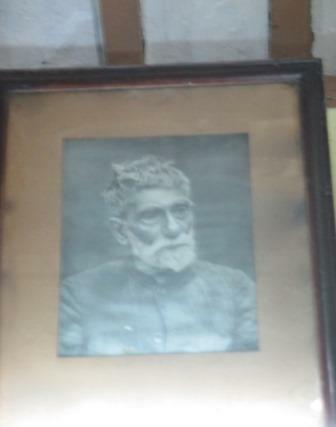 He points to the framed picture of Acharya Prafulla Chandra Ray and tells that without his inputs this flavourful sarbat could not be created. 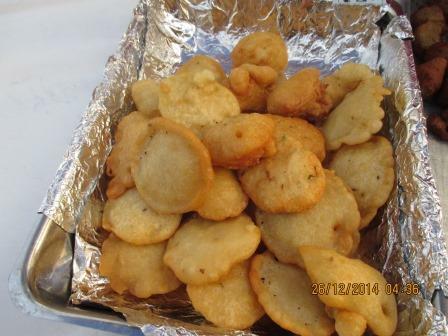 He sources tender coconut from Basirhat for this special sarbat. Mrigendu Majumdar by training is a lawyer and has been instrumental in introducing a new drink that caught our eyes- Passion Fruit Drink. 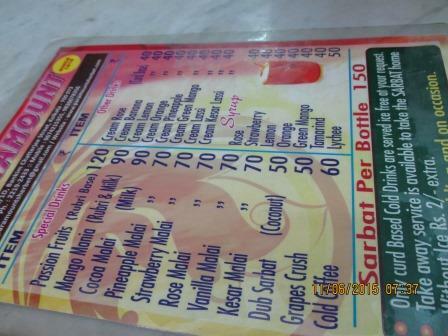 He recommended us to try out the signature Tamarind Drink to beat the heat. This legendary institution of drinks was also an important meeting point of revolutionaries who gathered here for meetings. Then, ‘it was known as Paradise’, tells Mr Majumdar. 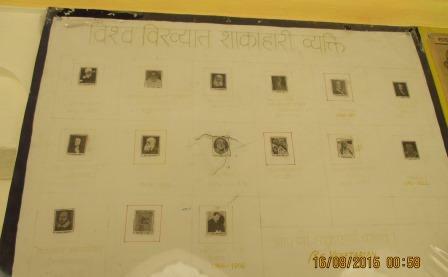 By 1937, British came to know of Biplobi Sammilani Samiti and Paradise was renamed as Paramount. Paramount has come a long way and as Mrigendu Majumdar prepares himself to leave for distant shores to take Paramount to non resident fans he shares of plans of celebrating 100 years of Paramount in a big grand way. Paramount will be 100 in 2018 and he plans to introduce new drinks as well as put on various memorabilia at display. A and I promise that we will be back in 2018 and wait for the new surprises. 1/1/1 D Bankim Chatterjee Street, Kolkata 73. I apologise to itiriti’s readers for staying away from blogging. Deadlines kept me away from blogging for few months. As I revive my plan to blog once again, I bring to you a series of food walks that you could undertake if you are planning to visit City of Joy. Let me confess that it is not the best time to be visiting Kolkata due to the increasing mercury levels as well the humidity. Still, the city’s lifeline lies in the evening strolls along the ghats of Hooghly river. On one such evening DP, SM and I ventured out to Bagbazar Ferry Ghat. 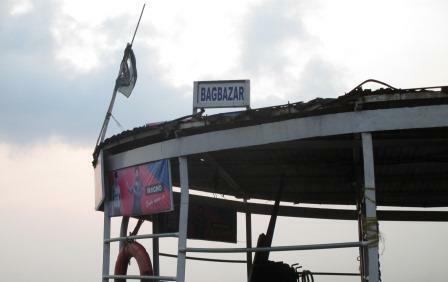 The ghat is well connected to Sovabazar, Howrah Railway station through the ferry service. As we waited at the jetty enjoying the cool breeze, we tried out one of the wonderful street food that you can enjoy along the ghats- Ghotigaram. Ghotigaram takes its name from the heap of coal cakes that keeps the bhujia mix warm as the hawker carries it around in a recycled oil tin with several aluminium cups with chopped onions, cucumber, amra, chat masala, salt, chopped chillies and a bottle of oil. Ghotigorom is available for Rs 5 and Rs 10. Newest addition to add a crunchy flavour is chopped carrots. Take a stroll, work on your appetite and head off to Allen Kitchen on 40/1 Jatindra Mohan Avenue. If you are a non-user of google maps and rely on landmarks I suggest that you use Sovabazar metro station as a landmark to reach this legendary place. If you plan to take a walk along Bagbazar ghat and walk down to Allen you have to cross metro station and keep on walking towards Girish Park Metro station. 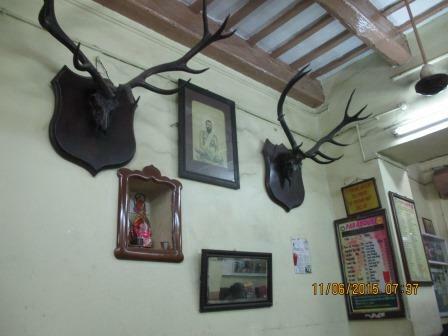 Another legendary place of cutlets (Mitra Café is on the opposite lane of Allen Kitchen). After you take a nice walk from Sovabazar metro station (towards Girish Park) you shall spot the blue board welcoming you. 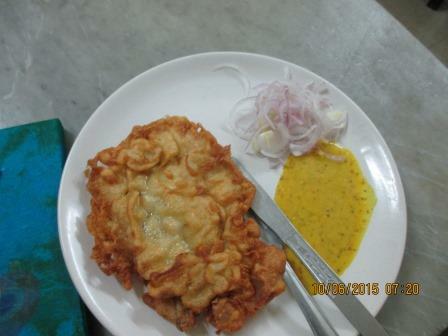 Allen Kitchen is known for its Prawn Cutlet. You should trek down to Allen to soak up nostalgia, skip the coolness of your air conditioner and dig into one of the many versions of cutlets the city has to offer. 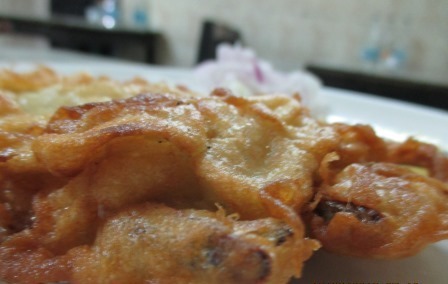 Cutlets are part of the colonial legacy and the city’s obsession with cutlets, steak and kabiraji have gave birth to many a legendary institution. Allen’s Prawn Cutlet is fried in a brand of ghee that many of us might be familiar with. Lakshmi Ghee is a well-known brand of clarified butter made from cow milk. Usually synonymous with luchi this cutlet smells divine and we could not wait to dig into the juicy prawn coated in a nicely salted coating. This simple coating enhances the prawn and smell of Lakshmi ghee lingers on. Served with salad (chopped onions, cucumber and green chillies), kashundi ( mustard sauce indigenous to Bengal) prawn cutlet remains a stealer because of its simplicity. We also ordered steak (mutton) which comes with an interesting sauce high on ginger paste. While I leave to your imagination why and how this steak came to be served in Allen Kitchen, its time to get back to work. 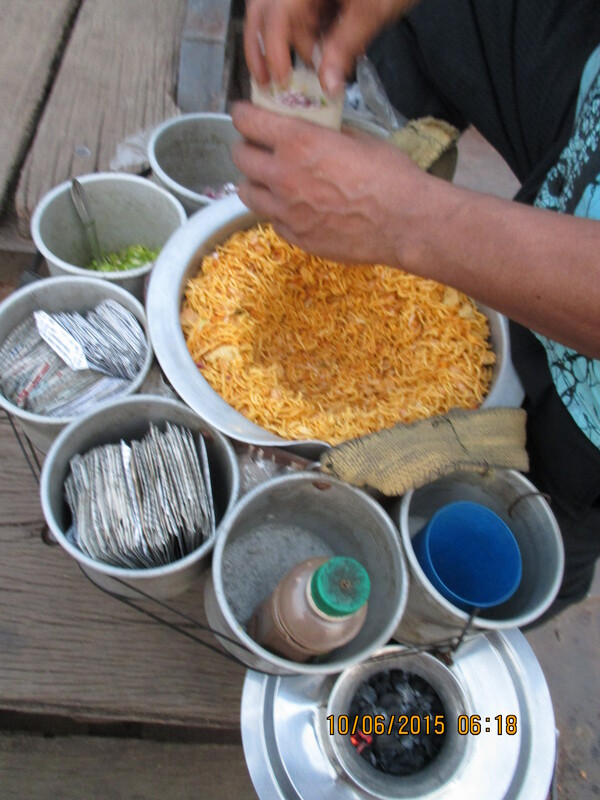 Today afternoon I met somebody whose job is envy to many of us who are in love with the city’s street food. As promised we meet near Gate No 5 Chandni chowk Metro station. He orders five bottles of water puts them in the jute bags for the leg of customised food walk kick starting from 5pm and shares with me his thoughts on JFC , Natraj ki aloo tikka, best nahari, paya and much more. Anubhav Sapra, the man behind Delhi Food Walks very graciously agreed for a conversation over his journey of Delhi Food Walks which has been in news for the street food tours across Delhi and beyond Delhi as well. His transition from working for Centre for Equity Studies to being his own boss, bringing street food to the forefront and his journey from being blogger in 2010 to owning and running Delhi Food Walks, is a wonderful inspiration and I thought it would be great to wrap up 2014 for itiriti readers. The anecdotes he shares is meaty and juicy for a small budget film if not a blockbuster. He began organising food tours for his foodie friends on Sundays along with a day job in Centre for Equity Studies. Slowly those food tours metamorphosed into Sunday walking tours as the numbers increased. And facebook played a revolutionary role here. 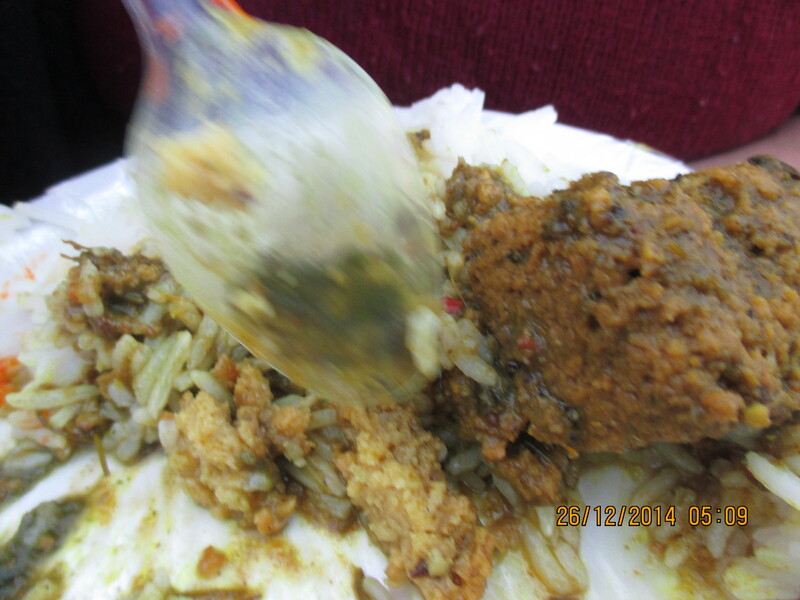 Way back in 2010 Anubhav posted an event that he was going to organise a food walk in Paharganj. Thirty odd people showed up. It was a huge success. This response encouraged him to organise more such tours on Sundays mainly around Old Delhi. Slowly by 2011 Delhi Food Walks was conceptualised and recently he has quit his day job and he works seven days a week from 8am to 9pm for Delhi Food Walks. Though he organises food walks around various nook and corner of Delhi, he loves to talk about the street food cultures of Old Delhi which as he endearingly puts it represents our syncretism. ‘Which place under the sun will have the best dishes made from vegetables, pulses and no onion and garlic and moment you walk over to another lane you can have the choicest pieces of lamb, goat and chicken?’ As I remind him of the best fried chicken, he remarks ‘oh yes, JFC you mean’. For all fried chicken lovers, it is a treat to get the best fried cuts from the shops right across Jamma Masjid and JFC rules! He tells me that old Delhi’s by lanes have a story to tell through food. I agree. He adds that each lane is a telling tale about food proscriptions practiced by community. One example he cites is the absence of onion and garlic in the condiments or stuffing of parathawallas of parathewalli galli. The owners, practicing Jains refrain from using onion or garlic and this is only paratha which is deep fried in ghee and I add, served with pumpkin curry and banana tamarind chutney. Nestled few yards away are the bakeries – a telling representation of cultures of bread making in India. As he recounts to me the bakeries in the by-lanes of Delhi he also recalls that in his childhood his mother used to knead the dough and send it off to local dhaba for rotis to be made. Our conversation moves to communal nature of making breads with the series of bakeries in Old Delhi still surviving by making rotis. No conversation of breads is complete without the famous kebabs and for kebab lovers Delhi Food Walks will soon announce a kebab and biryani trail in Old Delhi in January 2015. As time runs out and he welcomes me to join him for aloo tikki at Nataraj (Chandni Chowk) he also shares a passionate project geared to make use of left over food from city’s professional kitchens. Anubhav and his volunteers have done a survey regarding the management of excess food across city’s restaurant counter-tops. 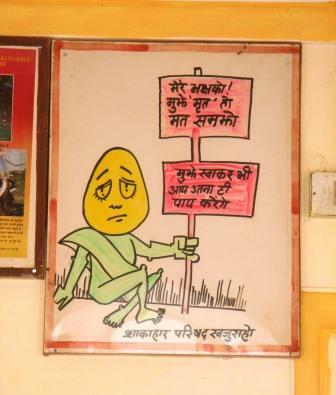 In this project called Save food foundation, their aim is to collect the food and redistribute it to the homeless in the city. As his guests arrive I join them for a piping hot aloo tikka chat at Nataraj and resist the temptation of joining them for the walk. 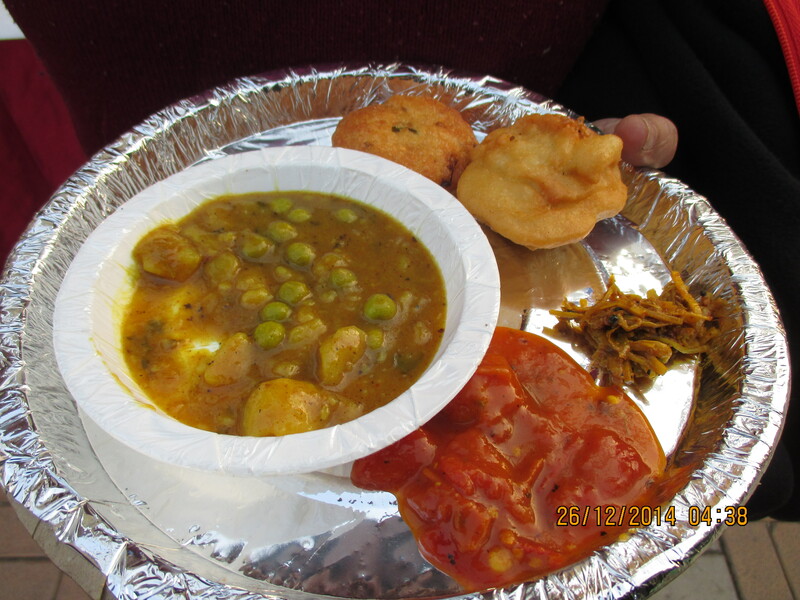 On weekdays, he organises customised food walks across the city. Customised walks are tailor-made for your tastebuds and it can be a combination of Old Delhi, Majnu ka Tila and Kamala Nagar. Some of the food enthusiasts across the world and India also join his specialised by-lane walks (available on requests) which lasts for three to four hours in Old Delhi. Apart from food, there is a lot of food talk about the spices, the process, and the people involved in making the food. On weekends, he organises community walks. These walks are listed in facebook and anybody can sign the walk. Of late he is organising walks around specific food items. For instance in December 2014 he organised a chat trail in Old Delhi which I hear was a huge success. 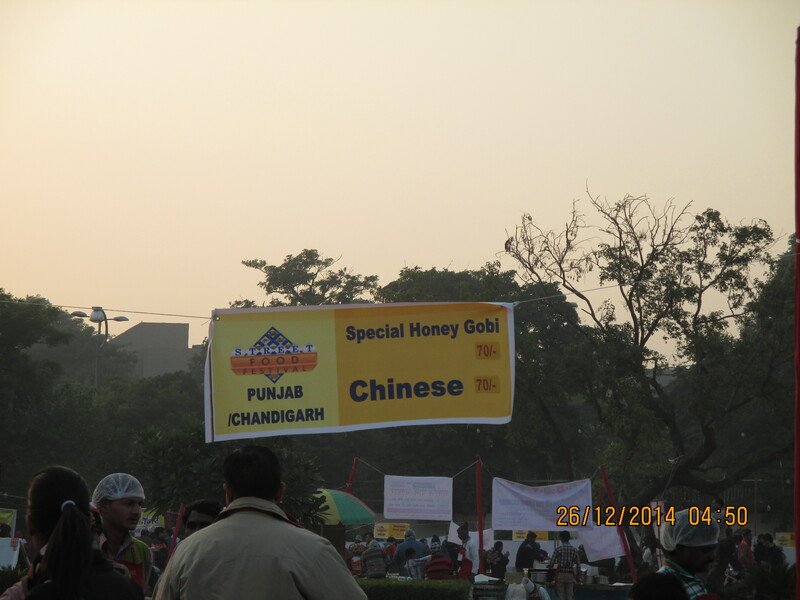 What is best about Delhi Food Walks is that they do not outsource the walks. So, Anubhav is here to guide you to have a taste of Delhi’s street food from 8 am to 9pm through city’s best kept secrets, and well known ones. As I leave him with the guests and make my way through the metro station I add the kebab and biryani trail to my wish list for January 2015 and head back home with food for thought. To more food talk in 2015! The winter chill has set in the capital and food cravings are an all time high. In an attempt to stick to deadlines, I have resorted to cooking one pot meals for some time now and today as I wrapped up a section I decided to treat myself to beetroot-carrot soup. 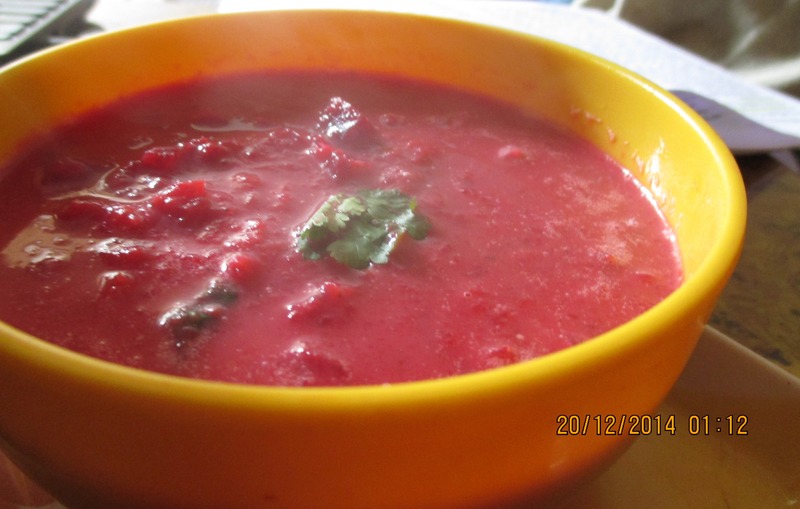 Armed with a beetroot, one carrot, half a slice of onion, two green chillies, slices of ginger, two sliced garlic pods, coconut milk, half a tea spoon of olive oil I set out to make this gorgeous chunky soup. 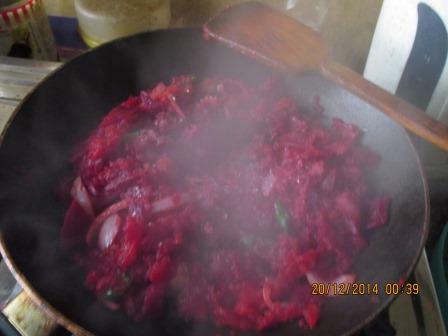 Roughly dice the beetroot, carrots and pressure cook it. I do not add salt to the water while boiling. Once the vegetables are boiled, shift it to a blender or in absence of one (like mine) use the pestle to mash the carrots and beetroots. Take a pan, add half a tea spoon of olive oil. 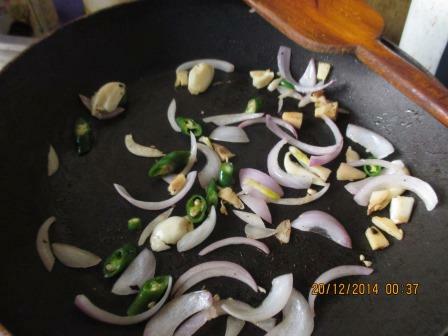 Add sliced garlic, onions, ginger, chopped green chillies and fry them till the onions are cooked. 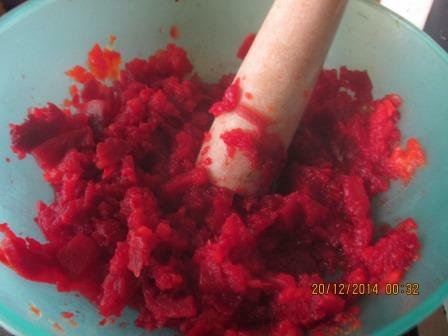 Now add the mashed beetroot-carrot to the mix. Fry them lightly. Add salt and a pinch of sugar. Fry it for some time. 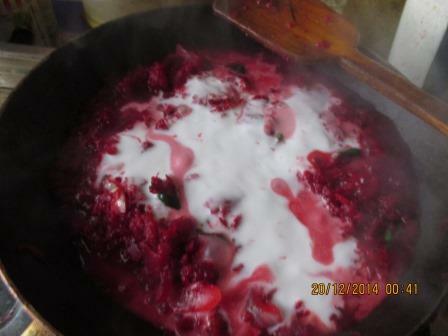 Add coconut milk to the mix and cook for a while. You might need to add half a cup of water in case you are using thick coconut milk. Bring to a boil and it is ready to serve. Let me tell you this soup is going to brighten up your day and lift up your mood. Time to wind up and get back to work. Drop me a line after you add your own twist while making this gorgeous soup. My association with religious places begins and ends with food. Every religious faith has its own way of feeding the hungry but langar – a practice common to Sufi Chisthi and Sikh traditions remains special for several reasons. People across faiths, and backgrounds are invited to sit and eat a hot piping vegetarian meal in regular intervals. 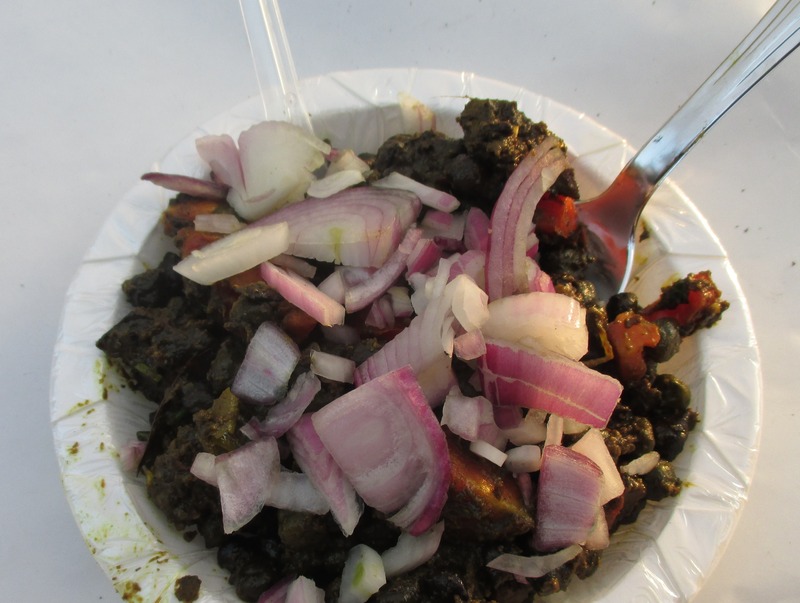 The hot piping meal comes from a community run free kitchen housed in Gurudwaras. 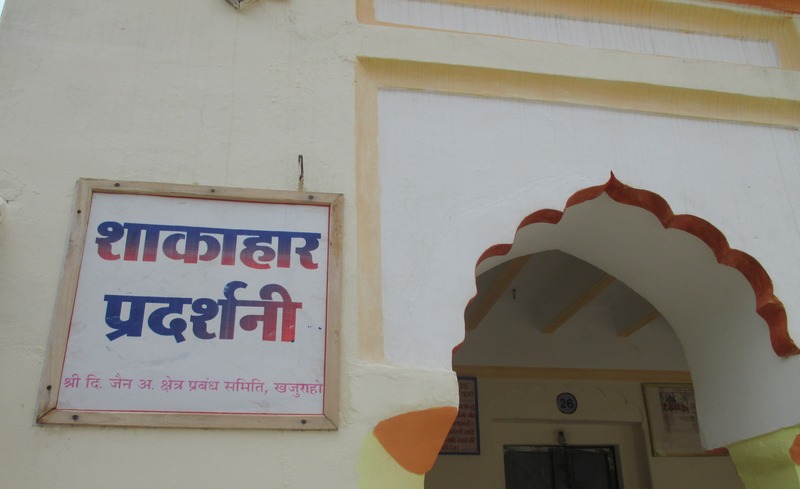 Sikh-langar, or free community kitchen draws upon earlier Sufi Chisthi practices where people across faiths could eat hot cooked meals in Dargahs. Harsh Mander in an article “From langar, with love” ( The Hindu, 12 January 2013) draws our attention to etymology of the word ‘langar’ which in Persian means a feeding centre and a resting place for travellers. He mentions of the round the clock kitchens run by Nizamuddin Auliya Chisti – a sufi saint. 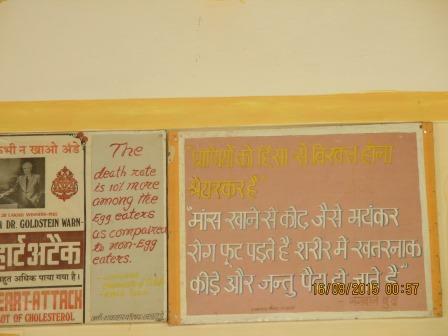 ‘Langar’ or any communal eating practices are particularly relevant in India as several registers of taboo prohibited people across caste groups to consume food together. 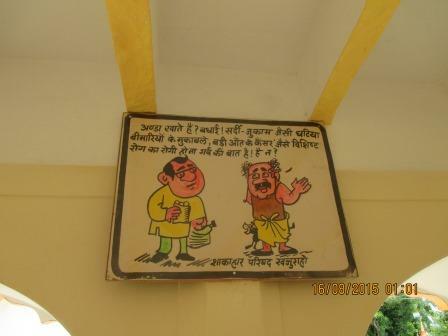 Under such proscriptions, ‘langar’ as a free community kitchen challenges that social order. 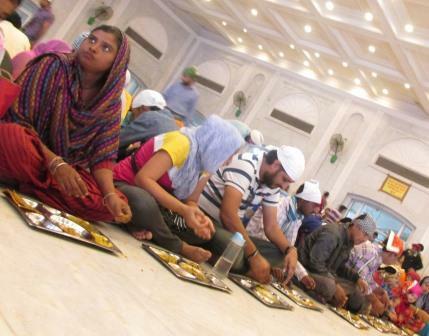 Though there have been reports of segregated spaces for homeless in Gurudwaras across Delhi, the spirit of ‘langar’ needs to be uphold in the right spirit. With shrinking public spaces which are accessible to all, the idea of a free community kitchen accessible to all remains special. My initiation to langar meal began in an all girls trip to Golden Temple of Amritsar and to this date I remember the fast pace and grace with which thousands of us consumed meal. The synchronised service between the kitchen staff and volunteers distributing food in the dining hall left me awestruck. 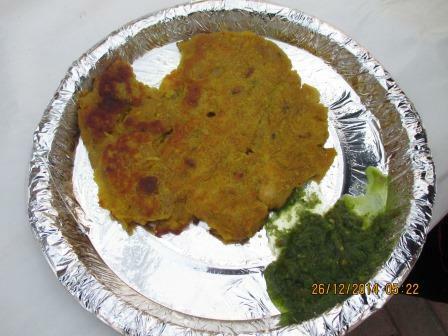 A trip to Golden Temple of Amritsar will remain incomplete without an experience of langar. 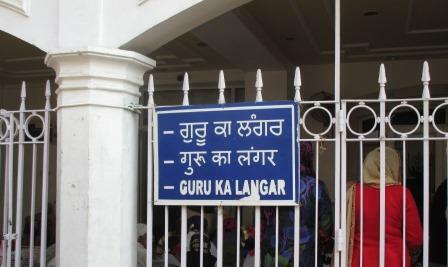 Closer home, Delhi, a langar at Gurudwara Bangla Sahib in Connaught Place runs a langar at regular intervals. Easily accessible via Patel Chowk Metro Station on Yellow line, the Gurudwara is teaming with devotees on a Sunday afternoon. As you make your way through the entrance you will be asked to leave your shoes at the shoe counter. 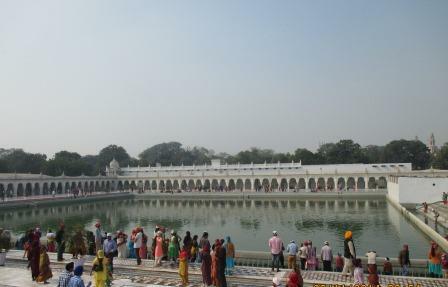 A visit to Bangla Sahib as it is popularly addressed remains incomplete without the karah prasad. Walk up to the counter on the left buy your coupons starting from Rs 11 to whatever you wish to offer and walk up to the counter to offer some and relish the karah prasad. The generous dollops of ghee holds the whole wheat flour, sugar and ghee together. Check a fellow blogger’s link for the recipe. 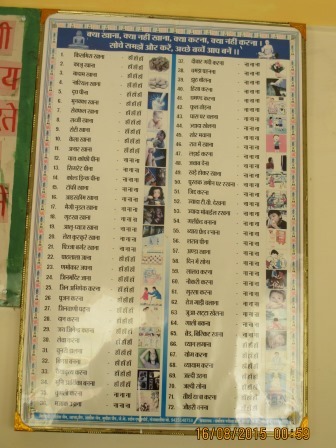 After a tour of holy shrine, sarovar head to the langar to not only have a lovely vegetarian meal of piping hot rotis, parathas, dal, vegetable curry and lovely kheer ( rice pudding) but also to offer voluntary service at the community kitchen. People across age groups ( from old and young ) make rotis and serve the devotees across faith who walk in queues for langar meals. As the devotees return their steel plates and another batch of people wait near the door to walk in, volunteers sweep the floor and welcome people in. 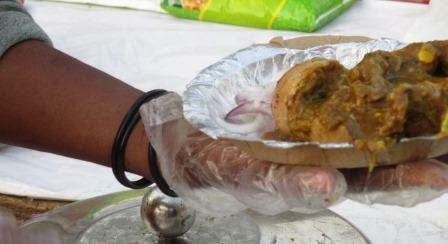 Every partake of langar be it in Amritsar or here is an experience to be cherished. If you are in Delhi or planning your next weekend halt, drop by at Gurudwara Bangla Sahib for a meal at langar, and karah prasad. 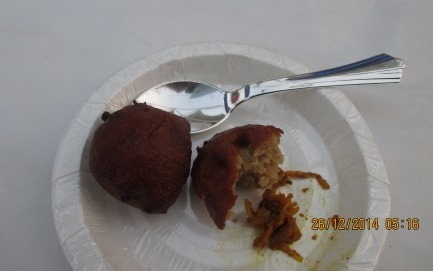 http://a-hint-of-spice.blogspot.in/2010/03/karah-prashad.html; Accessed on 23 November 2014. For Harsh Mander’s article please click on http://www.thehindu.com/opinion/columns/Harsh_Mander/from-langar-with-love/article4294049.ece; Accessed on 23 November 2014.